Laying in bed, Leo awakens to a horrible surprise; despite his orders for Don not to do so, his tech-savvy brother has outfitted him with a living metal replacement hand! Outraged, Leo chops the hand off, only for a metallic replacement to grow back. Leo chops that one off, too, and then both severed mits grow into full-sized robot Leonardos. Declaring that Leo “must be assimilated” and that “resistance is futile”, the robots seize the screaming Turtle. In the real world (and in his real bedroom), Don shakes Leo awake. Leo tells Don of the horrible nightmare he just had, but something more horrible awaits him; Don has actually outfitted him with a cybernetic hand! At the Foot HQ, Lieutenant Honshu greets Raphael, who is preparing to battle Pimiko for title of the Shredder. Choosing to fight the battle without the aid of the armor, Raph dons his bandana (for the first time in the whole volume!) and enters the arena. Pimiko awaits him and, from above, the two council members of the Japanese Foot begin the showdown. Raph and Pimiko go at it, but Pimiko’s ridiculous, clawed ponytail gives her the advantage (no, really) and she slams Raph into a pile of boxes. The council members then order her to finish the stunned Turtle. Back at the sewer lair, Don reassures Leo that the cybernetic hand contains none of his own living metal, but is simply a prosthetic. Leo tests the thing out, but isn’t satisfied as he’s unsure how it will perform in battle. Don grabs his bo staff and tells Leo to get ready to rumble. At Mikey’s apartment, he and Horridus are watching the “Casey Jones Day Parade” on TV, but eventually find something better to do: make out. At the parade, the Jones family rides atop a convertible, soaking in the fandom. Little do they know, Tony Puzorelli is watching the whole thing. Recognizing Shadow and now knowing where to find her, the mob boss swears to get his granddaughter back. And returning to Foot HQ, Pimiko is poised to draw blood, but Raph isn’t down for the count. Disabling her leg, he takes Pimiko out of the fight. Rather than kill her, he chooses to shame her by chopping off that stupid ponytail. The council members are not satisfied and demand Raph finish his opponent. Raph tells them to shove it. Incensed at his insubordinance, the council members have a nasty surprise in store for the Turtle: they have taken command of both the New York Foot Soldiers and the Shredder Elite Guard working for Pimiko. Raph and Pimiko then find themselves locked in a massive battle for their lives, as even Raph’s “loyal” lieutenant, Honshu, has turned against him. Back at Mikey’s apartment, Mike’s and Horridus’s lovefest is interrupted by Splinter and Rock. Rock informs Horridus that she has to return with the S.O.S. for a mission, and Mike follows to see her off. 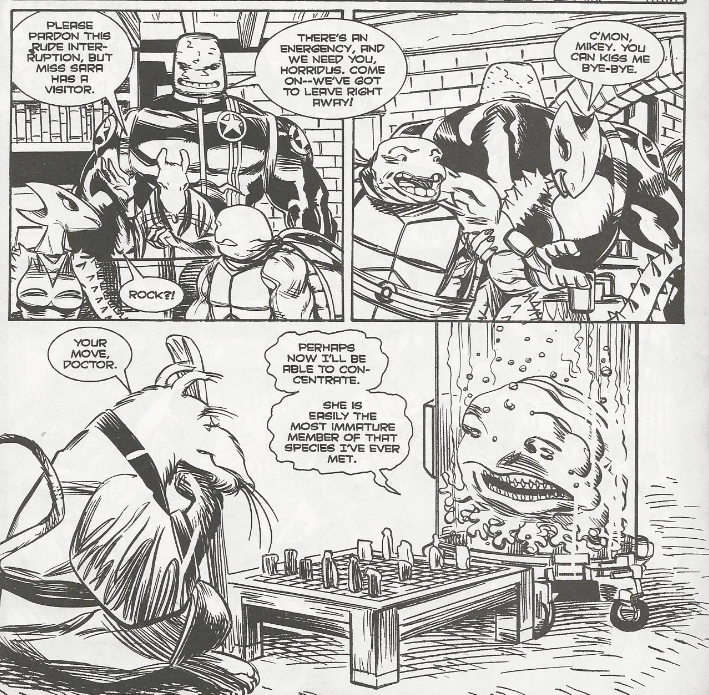 Peace and quiet restored at last, Splinter sits down to finish his chess match against the Utrom, Doctor X. *This story is continued from TMNT (Vol. 3) #21. The story continues in TMNT (Vol. 3) #23. *Casey turned in the corpses of King Komodo’s monitor lizards (which Leo actually killed) and gained celebrity as savior of New York’s sewers in TMNT (Vol. 3) #19. *Mikey rescued Shadow from the Puzorelli mob in TMNT (Vol. 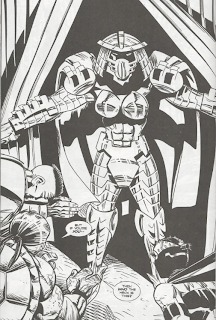 3) #8 and Raph (as the Shredder) negotiated peace terms with Tony-himself in TMNT (Vol. 3) #14. *Rock of the S.O.S. 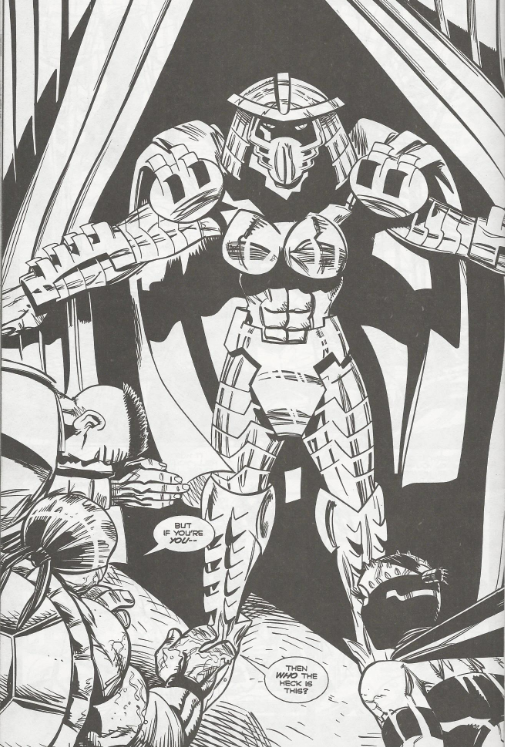 last appeared in TMNT (Vol. 3) #19. 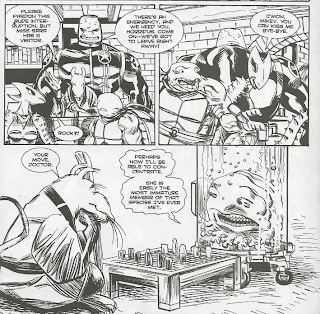 *Though he’s been referenced repeatedly by Raph, Cheng was last seen in TMNT (Vol. 3) #16. *Horridus will appear again in TMNT (Vol. 3) #25. *In the letters page, Carlson reveals that he had planned to let Leo’s hand grow back as the catalyst for a future storyline. This one was a doozy. Pimiko and Raph finally have it out over leadership of the Foot and neither of them won! The cliffhanger reveal at the end there originally took me by surprise, even though Lady Shredder was featured so prominently on the cover (just like Raph, I had assumed that to be Pimiko). Seeing Raph ousted as leader of the Foot so soon was a bit of a letdown, and I have to wonder if the decision was made as a result of Volume 3’s forthcoming cancelation or, if it was Carlson’s original plan from the get-go, if he intended to have Raph regain control at some point down the road? Either way, it was certainly cool to see Raph put on a bandana for the first time in the volume (even if it was a full-skull bandana and not the standard “robber mask” style of his brothers). A nice symbolic way of showing that he was fighting that battle not as the Shredder, but as a member of Splinter’s clan. Regrettably, the fight scene kinda loses its edge when you stop to look at or consider Pimiko’s stupid “killer ponytail”. The fact that it played an integral part in the battle, Raph’s victory and his near-escape makes it even harder to ignore, too. The other subplots of the issue take a major backseat to the A-plot here, though we get some headway on Puzorelli’s next scheme to kidnap Shadow (personally, I was kind of hoping that plot thread would be over with) and Leo bounces back from his disability, “Army of Darkness” style. Mike makes out some more with Sara which, while not thrilling, at least made for a funny gag for Splinter and Doctor X.
We’re just about done, here, which is a major shame considering the massive upswing in quality this volume was undergoing right before the axe fell. If this review seems short, that’s just because I’m going to have a lot to say in my review for the next issue. "*This story is continued from TMNT (Vol. 3) #20. The story continues in TMNT (Vol. 3) #22." "*This story is continued from TMNT (Vol. 3) #21. The story continues in TMNT (Vol. 3) #23." 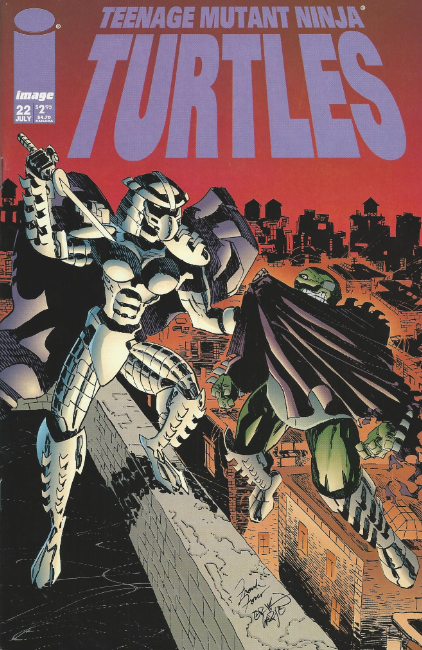 In any case, and with giving away spoilers, does Horridus (or any other Savage Dragon-related character(s)) make an appearance in TMNT (Vol. 3) #23? And nope, no Image cameos in #23! For some reason, I always thought Raph was wearing some kinda snazzy black jacket on the cover. I just now realized it is supposed to be his Shredder cape. Man, I can be so oblivious sometimes!